India’s Polar Satellite Launch Vehicle, in its thirty first flight (PSLV-C30), launches 1513 kg AstroSat into a 650 km orbit of 6 deg inclination to the equator. Along with AstroSat, six satellites from international customers viz., 76 kg LAPAN-A2 of Indonesia, 14 kg NLS-14 (Ev9) of Canada and four identical LEMUR satellites of USA together weighing about 28 kg – launched in this PSLV flight. 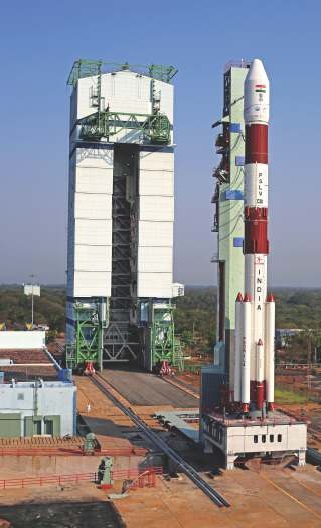 PSLV-C30 successfully launched from First Launch Pad (FLP) of Satish Dhawan Space Centre (SDSC) SHAR, Sriharikota. PSLV-C30 is the tenth flight of PSLV in its 'XL' Configuration. The earlier nine flights of PSLV-XL were PSLV-C11/Chandrayaan-1, PSLV-C17/GSAT-12, PSLV-C19/RISAT-1, PSLV-C22/IRNSS-1A, PSLV-C25/Mars Orbiter Spacecraft, PSLV-C24/IRNSS-1B and PSLV-C26/IRNSS-1C, PSLV-C27/IRNSS-1D, PSLV-C28/DMC3 missions. The total payload weight of PSLV-C30 is 1631 kg. LAPAN-A2 is a Microsatellite from National Institute of Aeronautics and Space-LAPAN, Indonesia. LAPAN-A2 is meant for providing maritime surveillance using Automatic Identification System (AIS), supporting Indonesian radio amateur communities for disaster mitigation and carrying out Earth surveillance using video and digital camera. NLS-14 (Ev9), a Nanosatellite from Space Flight Laboratory, University of Toronto Institute for Advanced Studies (SFL, UTIAS), Canada. It is a maritime monitoring Nanosatellite using the next generation Automatic Identification System (AIS). Four LEMUR nano satellites from Spire Global, Inc. (San Francisco, CA), USA, are non-visual remote sensing satellites, focusing primarily on global maritime intelligence through vessel tracking via the Automatic Identification System (AIS), and high fidelity weather forecasting using GPS Radio Occultation technology.